Theresa May has given her backing to Karen Bradley despite her comments about a lack of knowledge of Northern Ireland politics when she took the job. The Northern Ireland Secretary said initially she did not know nationalists did not vote for unionist parties or vice-versa in elections. Mrs Bradley also said she did not fathom some deep-rooted NI issues. Downing Street refused to be drawn on the criteria used by the Prime Minister to appoint ministers. Mrs Bradley told House magazine, a weekly publication for the Houses of Parliament. that Northern Ireland was "a very different world from the world I came from" and she did not realise campaigns are generally fought within each part of the community. "I didn't understand things like when elections are fought for example in Northern Ireland - people who are nationalists don't vote for unionist parties and vice-versa." "Actually, the unionist parties fight the elections against each other in unionist communities and nationalists in nationalist communities," she added. "The Northern Ireland Secretary is working incredibly hard to restore devolved government to Northern Ireland," a Number 10 spokeswoman said. "I knew that Karen Bradley moved particularly slowly when it came to delivering rights and justice to our community, but I didn't realise she was such a slow learner as well." However, the East Antrim DUP MLA Gordon Lyons said Mrs Bradley's lack of knowledge was understandable. "Obviously it is going to be a steep learning curve for anyone who is coming into the Northern Ireland brief," he said. 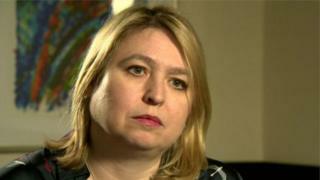 "I think actually Karen Bradley was giving an honest answer about what she understood about Northern Ireland before she came in here"
Labour's former Northern Ireland Secretary Shaun Woodward told the BBC that Mrs Bradley should have been better informed. He said it was a dangerous thing that Mrs Bradley went into the job "without understanding the basics". Northern Ireland has been without an executive since January 2017 after a bitter row between the governing parties, the DUP and Sinn Féin. On Thursday Mrs Bradley announced that she intended to cut Stormont Assembly members' pay. Karen Bradley has also ruled out calling a fresh Assembly election and she is to bring forward legislation to allow civil servants to make decisions in the absence of devolution. MLA pay will fall in November from £49,500 to £35,888. In her interview with House Magazine she said: "I had no idea how wonderful Northern Ireland was. I was slightly scared of Northern Ireland because of my impression and images from 20 years ago. That is not the place that it is today." "I freely admit that when I started this job, I didn't understand some of the deep-seated and deep-rooted issues that there are in Northern Ireland."